Mars and Phobos imaged by Hubble on may 12, 2016. Credits: NASA, ESA, and Z. Levay (STScI), Acknowledgment: J. Bell (ASU) and M. Wolff (Space Science Institute). On May 12, 2016, the Hubble Space Telescope captured a series of images of Mars and in them the planet’s moon Phobos can be seen appearing from behind the western limb. This was just 10 days before opposition which, in 2016, was the closest Mars had been to Earth since 2005, lending particularly good opportunity for picking out its largest—yet still quite small—moon. 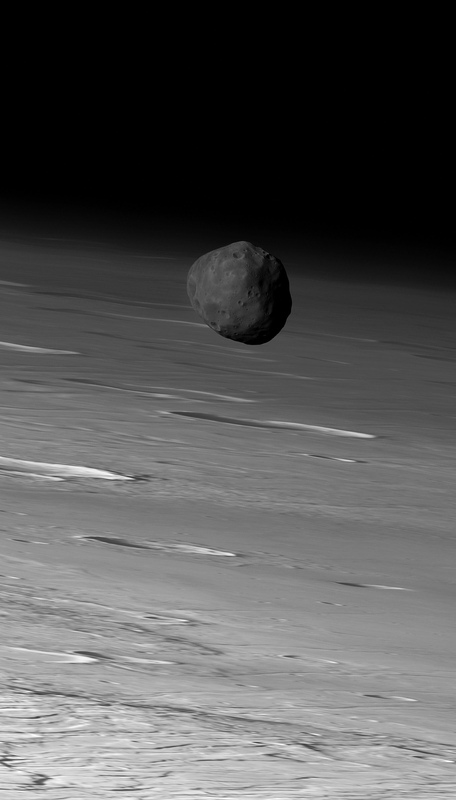 Phobos is a wee world, only about 16 miles (26 km) across. It orbits Mars at a very low 3,721 miles (5,989 km) altitude, and travels around it rapidly—7 hours and 39 minutes to complete a single orbit, which is considerably faster than the planet spins. 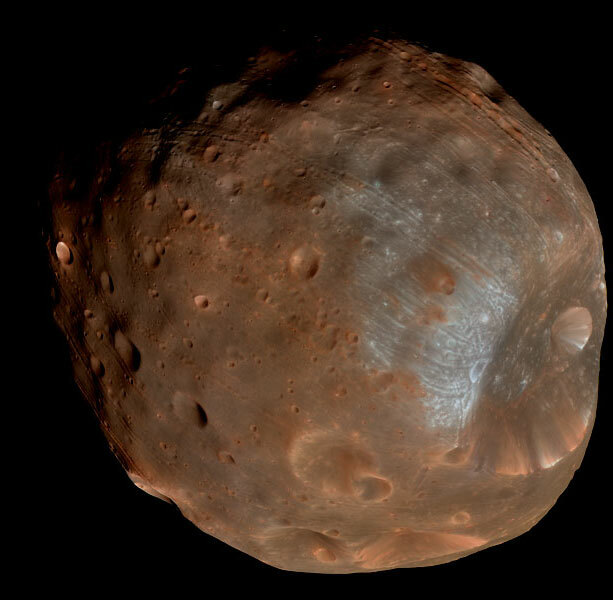 If you were to stand on Mars you could see Phobos multiple times a day crossing the sky, but only in certain locations—its altitude is so low it’s not even visible from higher latitudes. It would only be about 1/3 the size of the Moon in our sky, but if you were to stand on Phobos Mars would take up a full quarter of the entire sky! Mars has one other moon, the much smaller and farther-away Deimos. Both are named after mythical sons (Fear and Terror) of the Greek war god Ares, of whom the Roman counterpart is Mars. It’s interesting that these Hubble images were acquired during an opposition—when Mars is on the opposite side of Earth from the Sun and also close in its orbit—because it was during an opposition event that Phobos and Deimos were discovered…back in 1877. Read more from Universe Today’s Dave Dickinson here. See more images of Phobos here, and read more about the May 2016 Hubble observations here.